For the past three weeks, Christena Cleveland has been running a series she has called “Black to School”. She invited black students to reflect on their experiences interacting with predominantly white classmates. I’ve found the series fascinating for two critical reasons. First, I’m teaching Race and Ethnic Relations this semester. 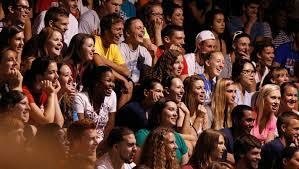 Second, and much more importantly, the students had all attended Christian colleges. She started with an unnamed student from a Christian college in the suburban Midwest. The second was from DeLisa who attended George Fox. Rashad was at Geneva. Nikkita from Seattle Pacific. Drew from an unnamed Christian college in Pennsylvania (I could make some good guesses on which one). Joy from Westmont. Finally, there was Jelani who transported from Portland (“the whitest major city in America”) to North Park in Chicago. Their stories are unique to them and yet cut across institutions. Some of their experiences result from the homogeneity of the evangelical populations that feed the colleges. Lack of exposure to difference causes insensitivity (which is why students felt it was okay to touch Joy’s hair). Other experiences reflect less defensible patterns. To assume that black males must be musical or athletic. To assume that black students are experts at hip hop or dance. To isolate black students in class or make insensitive remarks. To joke about perceived threats from athletic black men. The stories from these students break my heart. I can’t imagine asking any student to deny a part of identity. The sense of isolation they feel in the midst of Christian community is devastating. How can this be the case when we’re committed to a vision of Church that makes no separations (Galatians 3:28)? Christian colleges have long recognized the need to become more welcoming to diverse populations. We create diversity task forces and focus on recruiting minorities. We take pride in seeing our percentage non-white increase over the years. These are good things, but the focus on demographics doesn’t address the issues of institutional culture. The reality is that we’ve set the bar too low. We look at histories in which students of color were discouraged from attending at all or where interracial dating was seen as norm violating. Pew conducted a recent study on racial progress. In general, they found that whites felt that progress was being made on racial issues because past injustices were past. We take pride in not having separate bathrooms or poll taxes or segregated schools. It lets us think that because we don’t do those things anymore we’re making great progress. The Black to School stories remind me that the bar is really much higher. But it’s not those students who have to clear the higher bar. It’s me and folks like me. At a CCCU Sociology gathering nearly 25 years ago, I heard a remarkable presentation by Ray DeVries, then of St. Olaf and now of University of Michigan medical school. He spoke on Structural Evil, but quickly shifted from large scale issues like poverty or racism to the small-scale issues. The small-scale issues were the patterns of interaction that reinforced advantage for some and disadvantage for others. It’s easy to avoid being seen as racist. It’s hard to be open and welcoming to all we contact. Here’s where my Race and Ethnic Relations class comes in. I agreed to pick up the class about a month ago, but I’ve taught it several times before. This time, however, the class feels strange to me. When I lived in San Diego, we went to the Safari Park run by the San Diego Zoo. You got to ride around in little vans and look at animals in their “natural” habitat (if you ignore the fences that kept the lions from the zebras and so on). And now we come to the hyenas. Here are the giraffes! There’s a herd of gazelle! Most Race and Ethic books work like the Safari vans. After some introductory theoretical material, we look chapter by chapter at different racial or ethnic groups. Here are the Hispanics. There are the Asians. Here are the Blacks. Over there are the Native Americans! Each chapter looks at some historic patterns and then shifts to contemporary challenges for each group. But this runs the risk of setting that bar low again. It’s awful what we did to Native Americans. But we no longer relocate people from their native lands, do we?. We seriously exploited Chinese immigrants when we build the western railroads. Isn’t it great that we don’t do that anymore? Can you imagine what it was like to have segregated schools? Thank God, now all we have are schools characterized by residential isolation (sarcasm font needed). We then look at the patterns of economic achievement (or lack thereof), prison incarceration (or the avoidance thereof), family patterns, educational prospects, etc. We become aware that there are major gaps between whites and either hispanics or blacks. But we seem unaware of how those impacts play out. We set the bar too low because we don’t pay enough attention to the stories like those that Christena brought forth. Or this testimony this morning from Osheta Moore. Or this heartbreaking story from Grace Sandra. I’ve been trying to avoid reading comments on blog posts lately. The insensitivity of those denying someone’s story (maybe you could tell that differently, maybe you’re making too much of that slight) is hard to take. It’s as if these stories of being isolated, misunderstood, abused, or taken for granted don’t count. As it only the big stuff matters. This is where Ray DeVries’ talk messes with me after a quarter of a century. I know that I can’t ignore those stories without diminishing the experience of real people. What other definition of structural evil can there be? All this causes me to think deeply about this course I’m teaching this semester. The Race and Ethnic Relations course seems to invite consideration of Racial or Ethnic groups as reified structures. It’s as if we’d call the course RACE and ETHNIC Relations. I’m coming to see that we must, especially in Christian colleges, come to see the course as Race and Ethnic RELATIONS. If it’s the latter, there’s no way I’m off the hook. It would make me responsible, either directly or indirectly, for every one of the stories shared by Christena’s friends. I really appreciate your thoughtful reply, I am a product of a CCCU school, I worked for several years in CCCU institutions in areas of Multicultural student support. Yet, I would never encourage a person of color, or a white student for that matter, to attend a CCCU without some serious soul searching. Why? the stories Christena’s blog share are NOT exceptions, and they are not even the tip of the huge iceberg. You hit the nail on the head when you addressed ‘institutional culture” and not just “diversity”. Too many of our CCCU schools want postcard diversity but are unwilling to make cultural changes that would welcome the world into our schools. CCCU schools for the most part fail to see that their culture is often rooted in racialized theology and sociology. Until THAT is address no one, except those who embrace white cultural norms, will feel accepted for who they are. Thanks and keep up the fight! Thanks MarQue. I certainly understand your frustration with CCCU institutions and working in Multicultural support would make those frustrations even greater — you know too much about individual harm and way too much about institutional insensitivity to said harm. I’ve been a sociology professor and/or a senior academic administrator for over 30 years in five different Christian colleges. My argument is that CCCU institutions should not be points of separatist isolation from broader cultural trends but the proving grounds for living in the Kingdom of God. That means that I need students of color, students with high degrees of border crossing, and students from Iowa cornfields with no experience at racial interaction. When those parties together can see themselves as standing in common relationship to God’s creation and Jesus’ sacrifice, we have a basis to work toward commonality. That said, the institutions that head down the path I desire will have to be motivated by something other than fear, tradition, and a preference for quiet consensus. But I do believe we have the theological toolkit to pull that off, if we’re willing to use it. By the way, I absolutely loved this piece you wrote. http://mmjmpls.org/2013/07/17/why-i-must-write-and-speak-about-race/. It’s a very nice supplement to what I was trying to say. I am so grateful for Professors like yourself! – Keep being a voice and a light! Thanks for the reply.